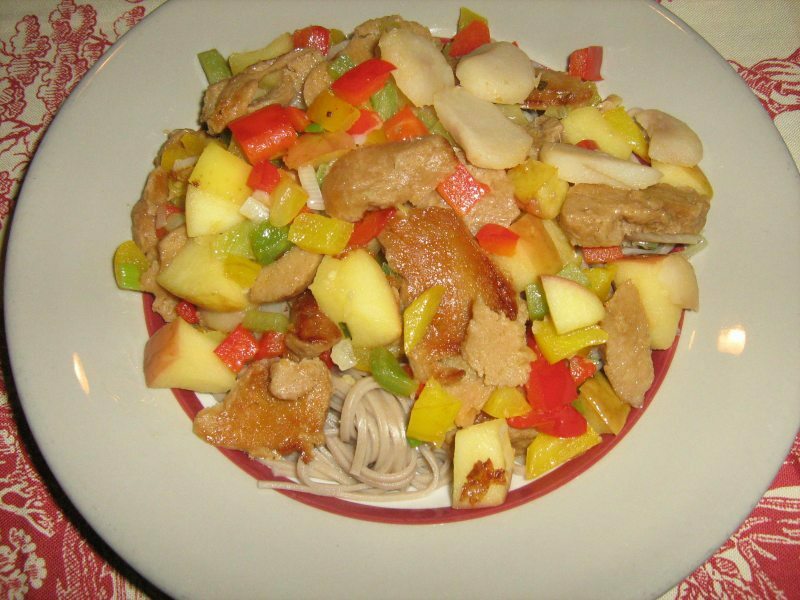 Our Apple-Seitan Stir Fry really is a filling dish that perfectly melds the various flavors found in the ingredients and the spices. In addition, the texture is fantastic and features fruity apples and crispy water chestnuts, among other terrific ingredients, like peppers and onions. But the clincher here is the seitan. Done in thin medallions and stir-fried just right, the seitan might even fool the most ardent meat lover! Combine jam, Bragg's or soy sauce, water and cornstarch in a small bowl then set aside. In a large non-stick skillet, heat sesame oil over medium high heat. Add seitan and ginger and stir-fry until seitan is browned, about 3-5 minutes. Transfer seitan and ginger to bowl. Add canola oil to skillet. Stir-fry peppers, water chestnuts, and apples until peppers are crisp tender, about 3 to 5 minutes. Add seitan and scallions back into skillet. Stir-fry 3 to 5 minutes. Add jam mixture. Continue to stir-fry one to two minutes, or until sauce thickens. Season to taste with black pepper. Serve over soba noodles with a side of fresh fruit such as seedless red grapes.